Using a familiar tool in a way it was never intended to be used opens up a whole new method to explore materials, report UConn researchers in Proceedings of the National Academy of Science. Their specific findings could someday create much more energy-efficient computer chips, but the new technique itself could open up new discoveries in a broad range of stuffs. Atomic force microscopes (AFM) drag an ultra sharp tip across materials, ever so close but never touching the surface. The tip can feel where the surface is, detecting electric and magnetic forces produced by the material. By methodically passing it back and forth, a researcher can map out the surface properties of a material in the same way a surveyor methodically paces across a piece of land to map the territory. AFMs can give a map of a material's holes, protrusions, and properties at a scale thousands of times smaller than a grain of salt. AFMs are designed to investigate surfaces. Most of the time, the user tries very hard not to actually bump the material with the tip, as that could damage the surface of the material. But sometimes it happens. A few years ago, graduate student Yasemin Kutes and Justin Luria, a postdoc, studying solar cells in materials science and engineering professor Brian Huey's lab, accidentally dug into their sample. At first thinking it was an irritating mistake, they did notice that the properties of the material looked different when Kutes stuck the tip of the AFM deep into the ditch she'd accidentally dug. Kutes and Luria didn't pursue it. But another graduate student, James Steffes, was inspired to look more closely at the idea. What would happen if you intentionally used the tip of an AFM like a chisel, and dug into a material, he wondered? Would it be able to map out the electrical and magnetic properties layer by layer, building up a 3-D picture of the material's properties the same way it mapped the surface in 2-D? And would the properties look any different deep inside a material? The answers, Steffes, Huey, and their colleagues report in PNAS, are yes and yes. They dug into a sample of bismuth ferrite (BiFeO3), which is a room temperature multiferroic. Multiferroics are materials that can have multiple electric or magnetic properties at the same time. For example, bismuth ferrite is both antiferromagnetic—it responds to magnetic fields, but overall doesn't exhibit a North or South magnetic pole—and ferroelectric, meaning it has switchable electric polarization. Such ferroelectric materials are usually composed of tiny sections, called domains. Each domain is like a cluster of batteries that all have their positive terminals aligned in the same direction. The clusters on either side of that domain will be pointed in another direction. They are very valuable for computer memory, because the computer can flip the domains, 'writing' on the material, using magnetic or electric fields. When a materials scientist reads or writes information on a piece of bismuth ferrite, they can normally only see what happens on the surface. But they would love to know what happens below the surface—if that was understood, it might be possible to engineer the material into more efficient computer chips that run faster and use less energy than the ones available today. That could make a big difference in society's overall energy consumption—already, 5 percent of all electricity consumed in the US goes to running computers. To find out, Steffes, Huey, and the rest of the team used an AFM tip to meticulously dig through a film of bismuth ferrite and map out the interior, piece by piece. They found they could map the individual domains all the way down, exposing patterns and properties that weren't always apparent at the surface. Sometimes a domain narrowed until it vanished or split into a y-shape, or merged with another domain. No one had ever been able to see inside the material in this way before. It was revelatory, like looking at a 3-D CT scan of a bone when you'd only been able to read 2-D X-rays before. "Worldwide, there are something like 30,000 AFMs already installed. A big fraction of those are going to try [3-D mapping with] AFM in 2019, as our community realizes they have just been scratching the surface this whole time," Huey predicts. He also thinks more labs will buy AFMs now if 3-D mapping is demonstrated to work for their materials, and some microscope manufacturers will start designing AFMs specifically for 3-D scanning. Steffes has subsequently graduated from UConn with his Ph.D. and now works at GlobalFoundries, a computer chip maker. 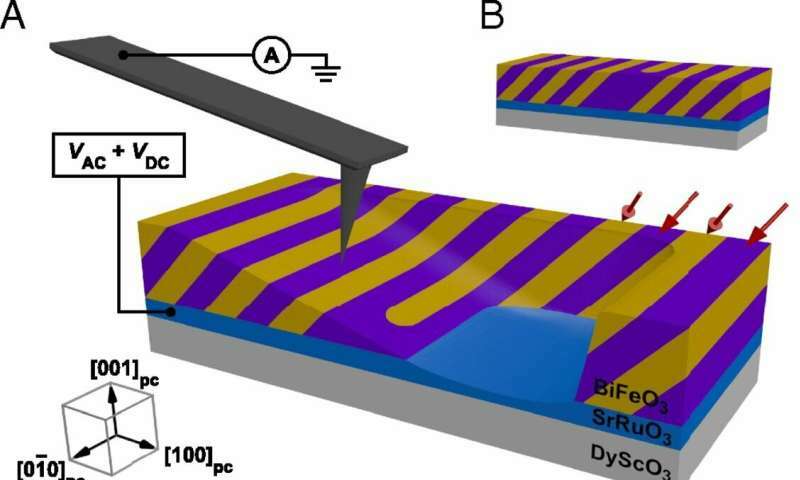 Researchers at Intel, muRata, and elsewhere are also intrigued with what the group found out about bismuth ferrite, as they seek new materials to make the next generation of computer chips. Huey's team, meanwhile, is now using AFMs to dig into all kinds of materials, from concrete to bone to a host of computer components. "Working with academic and corporate partners, we can use our new insight to understand how to better engineer these materials to use less energy, optimize their performance, and improve their reliability and lifetime—those are examples of what materials scientists strive to do every day," Huey says.